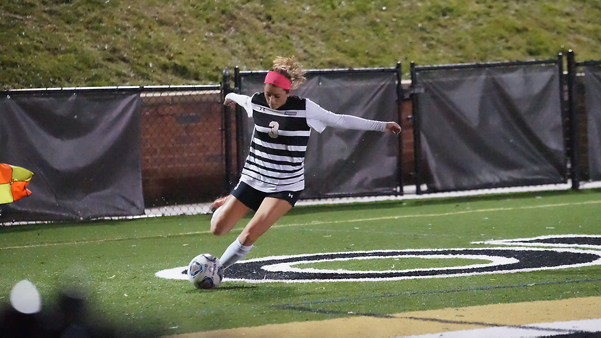 Lindenwood women’s soccer got its first October win Friday night when they defeated the University of Nebraska-Kearney Lopers 2-1 at Hunter Stadium. The Lions entered the home matchup 5-5-2, but the decisive two-goal lead they obtained in the first half allowed them to put another victory on their record. The visiting Lopers fired off two shots in the first five minutes, but Lindenwood would quickly find the first goal. At under seven minutes in, forwards Maggie Miller and Katie Richter maneuvered down UNK’s left flank to allow Miller to deliver a pass to junior Sammi Gregory, who scored the first goal of the match. In the 16th minute, forward Morgan Weller took a shot at the Lopers’ goal, but her effort was denied by goalie Allie Prososki. Half an hour into the game, the Lions increased their lead even further. Weller wrangled possession of the ball and passed it to freshman Emily Jowers, who kicked it right past Prososki to score her first goal of her collegiate career. Lindenwood continued to hold UNK scoreless for the rest of the half, but when play resumed after the break, the tide started to shift. In the second period, the Lopers bombarded Lindenwood with 12 shots, six of which were on goal, while preventing the Lions from taking a single shot. In the 62nd minute, UNK freshman Bridget Barker found the back of the net from 21 yards out, bringing the score to 2-1. Despite this, Lindenwood was able to uphold its lead. Goalie Megan Swanson tallied seven saves in the match, protecting the Lions from the Lopers’ second-half attack. The victory brings Lindenwood’s MIAA record to 3-2-1. Next, they face Fort Hays State University 11 a.m. on Sunday at home.